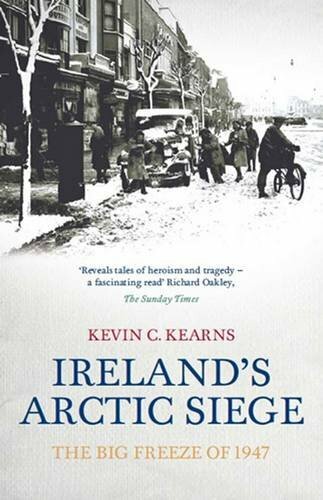 During the summer I read Kevin Kearns' excellent account of one of the worst winters on record ever endured in Ireland. It was called "The Big Freeze" which lasted two months, and brought the country to a standstill. I had meant to write a short review when I finished reading the book, but it has been sitting on my desk now for months and it is finally time to review and put it away. Kearns writes about the hardships suffered by everyone, most notably the poor living in tenements in Dublin. Bad freezing weather meant that ordinary things like fuel and food were running out fast, and as always, it was the poorest that suffered most. Since Ireland did not possess any equipment to clear roads and railway lines, there was hardly any traffic for two months meaning that aid could not be delivered to those that needed it. One thing that comes in for particular criticism was the de Valera government's inaction throughout what was a national crisis. Kearns tells of tales of bravery and of tragedy in the east and west of the country. The lack of leadership stands out, and it was the ordinary citizen that won out in the end. My Dad was in school in Roscrea in the mid-lands at the time and remembers very little bad weather. Areas like Cork were not affected too much in what was a long spell of cold right across Western Europe. I remember the harsh winters of 1981/1982 and 2010/2011, but they were nothing like the misery our parents and grandparents endured in 1947. I really enjoyed the book, but did think it was a bit long - I wondered which would come first, the end of the snow or the end of the book.